There are many things to consider when you go shopping for a sewing machine, especially if you plan to use it mostly for makings clothes. Before anything else, take a good look at your wallet and decide how much you are willing to pay for the machine. Getting your eyes on something that is far from your initial price range is frustrating most of the times. Knowing how dedicated you are to sewing is also very important, as there is no sense is getting a heavy-duty sewing machine if you only sew few times a year (except for the part where money really doesn’t matter to you). If you already know what your job and make clothes for your family or as a small home business, it’s also clear that you know what type of materials you mostly use. It’s one thing when you are only sewing thin fabrics and totally another when you have to guts to make some winter jackets for your kids. Either you choose a heavy-duty machine with basic functions; either you step up your game and try the fancy stitches that come in your machine, the market is full of options to choose from. In addition, if you are the type that also uses embroidery on their clothes, a hybrid machine that gives you also embroidery stitches is the choice to go with. Last but not least…don’t forget to get the right thread for your machine. No matter how great it may look on the shelf, it may fail on you if you’re not giving it the right thread! When it comes to the Brother CS 6000i, you don’t need to be an expert to get it why it’s so popular. Not only does the sewing machine come at an impressively moderate price, but it’s also loaded with multiple features that may well convince you to buy it. 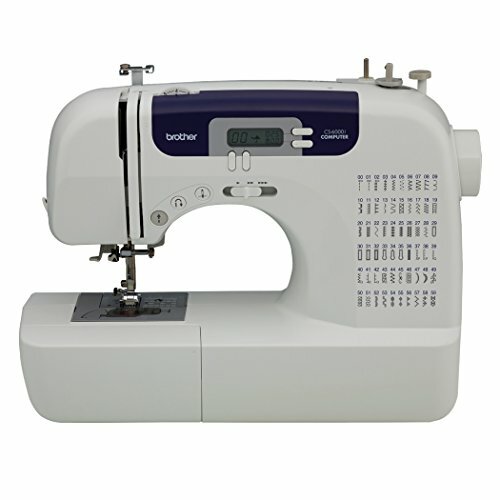 The Brother CS6000i is versatile so it’s great to use in many various sewing and quilting projects. It comes with accessories that are stored inside a compartment on the arm, so they’re always easy to reach while in the middle of your project. So, forget about fishing for the bobbin thread when using the Brother CS6000i. The sewing machine is also highly adjustable so you can have various settings for your stitches or the stitches’ length and width. This is done really easy, using the settings on the LCD display. The operation is a no brainer either, which may also explain why the Brother CS600i is so popular among the entry-level users too. A stop/start button lets you use the machine without the built-in foot control. Furthermore, you may also use the various speeds that are easy to set, according to your sewing project. The sewing machine is jam-resistant which is always good news. The quick-set top drop-in bobbin allows you to easy set and access to bobbin thread. 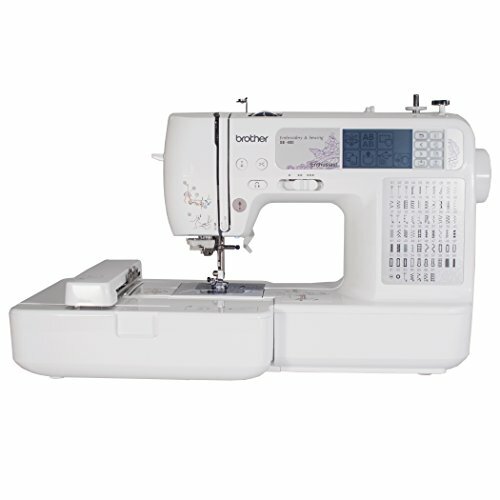 All of these features recommend the Brother CS6000i for any beginner, but the machine doesn’t disappoint a more experienced seamstress either. Truth be told, the Brother CS6000i isn’t just going to help you get through the basics of sewing, but it’s also able to take everything to the next level- as long as you’re up for it. We don’t just like the features of the machine, but also its looks. The machine does make a nice first impression and its oversized table is amazing if you’ve got some big quilting projects lying ahead. If you’re not afraid to start your very first quilt, the Brother CS6000i is definitely the machine to go with. Let’s not forget to go over the accessory feet that are plenty and functional, giving you the opportunity to try various jobs, as complicated as you’d want. Here are the feet that you get to use with the Brother CS6000i: zigzag, the walking foot, blind stitch, spring action quilting, monogramming, buttonhole, and button fitting foot. The stitches are also numerous and various so it’s up to you to choose the right one on a specific job. You may also give it a try with sewing some jeans with the machine, as long as you’re using the right needle and the specific speed for it. No worries when it comes to threading nor for sewing cuffs and sleeves: the machine comes with a built-in free arm for cuffs and sleeves. As for the LCD screen of the machine, we can honestly say it matches the entire build. It’s user friendly, responsive and quite easy to navigate through when making the specific settings for the jobs. The machine does come with an impressive list of settings, features and options but using them isn’t that complicated, even if you’re a starting seamstress. The accessory pouch is also important enough to be noted and it can store quite a few accessories: needle set, seam ripper, spool pin, spool caps, eyelet punch, bobbins, and even a cleaning brush. The Brother CS6000i comes in a rugged protective case and it’s very easy to install. It comes with English/Spanish operation manual. As for the sound level, no stress there either. The machine runs smoothly and the risk for jamming is minor. All in all, for a very good price, you get a sewing machine that helps any beginner get better at sewing and satisfies successfully the needs of the experienced seamstress as well. 2. 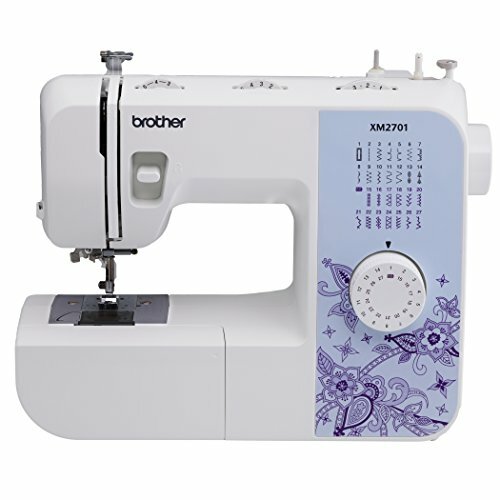 For those of you who want to make some clothes, but don’t want to open a business any time soon, a fair option is the Brother XM2701 Lightweight. The machine is very easy to use and versatile, which increase its value already. You may use it for many types of projects and materials. The machine comes with 27 built-in stitches that include not only some basics stitches, but also zigzag, stretch, blind hem. The easy dial stitch selector is very easy to operate. It’s not difficult to add some buttonholes as the machine features the auto-size buttonholer. When we mentioned the versatility of the machine, we sure thought about the 6 quick-change sewing feet: zipper, zigzag, narrow hemmer, blind stitch, button sewing feet and buttonhole foot. The ease of use comes also from the built-in needle threader, the jam-resistant top drop-in bobbin and the easy threading system. The machine features bright LED that light up the working area and a convenient built-in free-arm to sew pant legs, cuffs or sleeves. The machine comes with instructional DVD, both in English and Spanish. It has a compact shape and is rather lightweight. Cons or not, we still recommend the machine as a great choice especially considering its low price. 3. When you’re not just making clothes, but also do it as a home business, you need a strong, heavy-duty machine that is able to take the intense use and gives you speed and efficiency on your jobs. 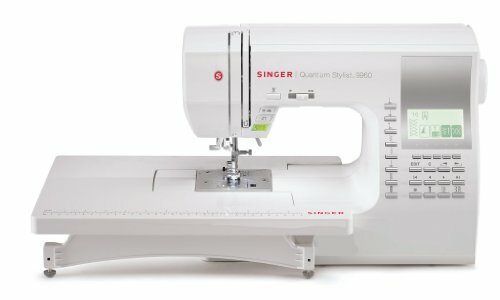 A good option is the SINGER 9960 Quantum Stylist 600-Stitch Computerized Sewing Machine that comes with so many features that recommend it as a power horse. The computerized machine comes with 600 built-in stitches, 5 different fonts and 13 fully automatic 1-step buttonholes. The list of features is rather long and it begins with the automatic thread cutter and the automatic needle threader that give help your fast and clean. There are many adjustments you can make on the machine and the adjustable width and length of the stitches is just one of them. The machine comes with extension table, which is very helpful when you work the larger items. Needle up/down button is efficient and increases your efficiency on the larger items. The top drop-in system wins you time on the jobs, whereas the stitching editing abilities of the machine lets you choose the right stitch pattern for a specific fabric/job. The 19-presser feet on the machine increase the abilities of the machine to get through a great diversity of jobs and fabrics. The list of features also includes the electronic autopilot and speed control, which simply encourages you to get better results. We also notice so many other functional features: free arm, drop feed, warning animation, electronic twin needle control, the automatic tension. The LCD screen is responsive and quite user friendly. The machine is easy to setup and to use and so is the threading. It runs quiet and is able to sew multiple thick layers. The minimal issues don’t take away the overall quality of the machine that is able to boost up your efficiency and speed on your making clothes small business. 4. Investing in a good quality sewing machine for making clothes is a big step and it’s better to do it when you are truly dedicated to sewing. 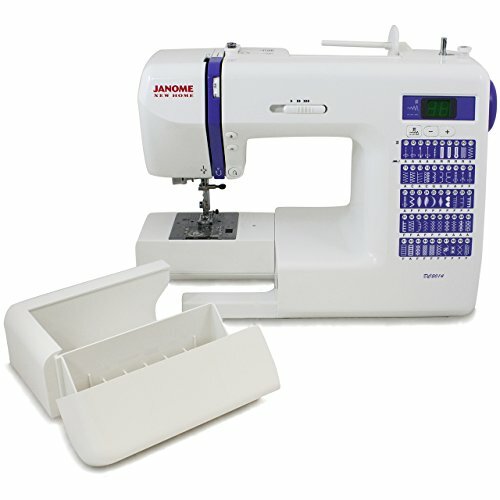 The Janome DC2014 Computerized Sewing Machine gives you not only reliance for many sewing jobs, but also various options to fit various sewing applications. 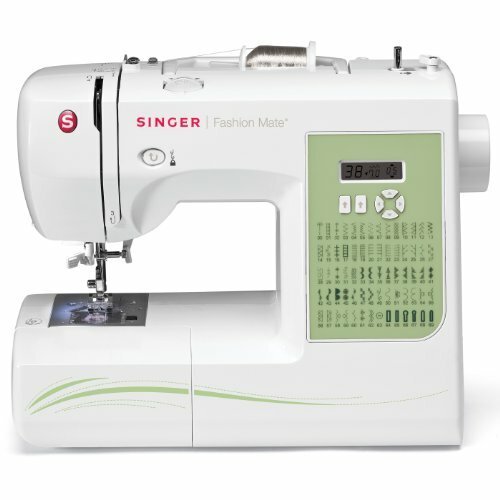 The machine comes with 50 built-in stitches and 3 one-step buttonholes so you get to be creative and accurate. The superior feed system (SFS) gives you speed. We notice on the list of features the drop feed, the easy reverse button, the Snap-On presser feet that helps you use the right settings for various jobs. The machine presents also 7-piece feed dog, automatic thread tension control, memorized needle up/down, locking stitch button and a free arm. The very high presser foot lift is efficient as it is the quilting guiding bar. Getting more specific about the presser feet, we see the machine presents even feed foot, automatic buttonhole foot, over edge foot, zipper foot, satin stitch foot, adjustable blind hem foot and you can tell by their names when it’s the case to use each one of them. The top loading full rotary hook bobbin is efficient and easy to operate. The machine also comes with start/stop button and a speed control slider. The bright LED screen is clear, responsive and easy to navigate through. The machine runs quiet and has a sturdy construction. It’s very well made and is long lasting. Despite the minimal problems, the machine doesn’t fail on you if you make clothes on regular basics. 5. 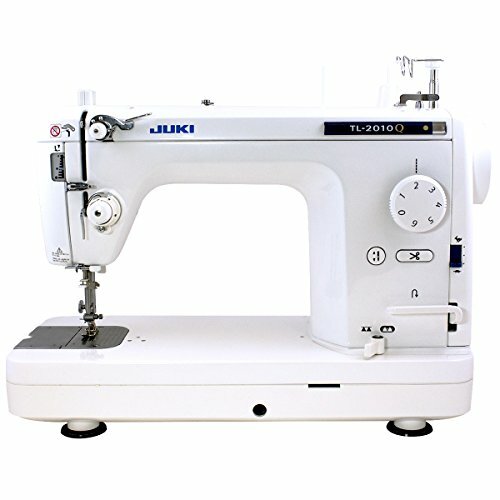 The versatility and reliability that the Juki TL-2010Q 1-Needle gives you is impressive and when in need for a new asset for your home business, the machine is a sure investment. The machine is a Single Needle Lockstitch Machine that is great for straight stitching, quilting, dressmaking and even home décor items. You may mount it into cabinets and use it as a tabletop machine or on machine quilting frames. Taking a closer look, we see a machine with aluminum die cast design, which makes it both lightweight and long lasting. The machine is highly portable and the carry handle sure makes it easier to carry it around. Let’s go through the features and keep in mind the machine comes with automatic thread trimmer (great for a nice, clean job every time), the predetermined stop position for the needle and the variable speed control slider. The machine also comes with automatic threading, speed control lever; foot controlled trimming system and sub tension system. As you notice, the machine offers you the ability to make so many various adjustments, for so many different job applications. You may also adjust the length of the stitches, using an easy-to operate dial. The machine is fast or slow, depending on your needs and it can sew from 200 stitches per minute (the lowest) up to 1,500 stitches per minute. When you want to work on larger items, the machine is also reliable as it comes with an extension table. The list of accessories is quite long, as a matter of fact. The versatility of the machine is also to notice as it can sew so many types of materials, from the thin satin, to velvet, fur, suede and even leather or rubber. It’s strong enough to sew multiple layers of materials. Even though it’s such an impressive machine, the setup is easy and so is the use. If you are looking for a versatile, dependable machine that is great for making clothes and quilts at the same time, don’t hesitate and give the machine a go. 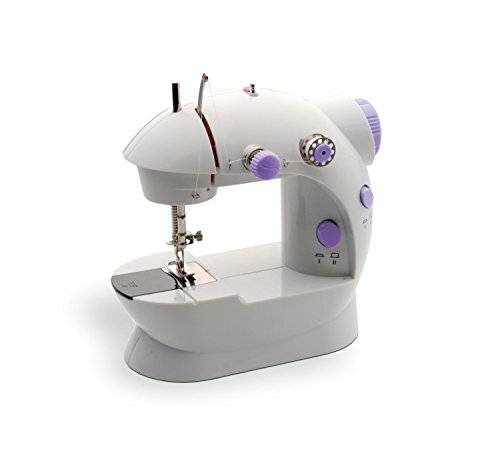 If you want to invest in a computerized sewing machine as it typically comes with so many types of built-in stitches but don’t want to spend too much money, you can find good quality machines for a fair price. 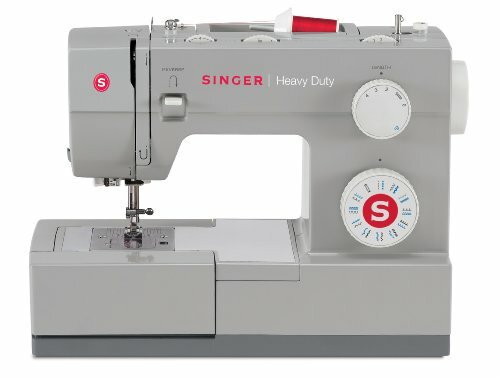 It’s the case of SINGER 7256 Fashion Mate 70-Stitch Computerized that gives you so many sewing options, making it a great choice when making clothes. The machine comes with 70 built-in stitches and several features that increase its versatility and ease of use. The list of features begins with the 5 presser feet that you get to use according to a specific sewing job. Use the zipper foot, the buttonhole foot, the blind hem foot and the sating stitch foot in the addressed jobs. In addition, if it’s not the job for any of them, use the all-purpose foot instead! The ease of use comes also from the easy threading system, the automatic needle threader, the easy-to-load top drop-in bobbin system with clear cover. It’s not difficult to set a specific stitch due to the push-button stitch selector nor to use the automatic stitch length and width. The machine comes also with six fully automatic one-step buttonholes so you may get more creative on your clothes. The instruction is easy to understand and to follow. The machine runs fast, smooth and is rather quiet. It’s sturdy and has a good built. It comes with plenty of accessories that you may find of big help. All in all, you get a dependable sewing machine that delivers good performances on so many jobs. Going shopping for a sewing machine with just a few bucks is no picnic, but this doesn’t mean you get back empty handed. By all means, it’s very likely that you can come back with a dependable option like the Brother LS2125i Easy-to-Use. Obviously enough, you shouldn’t expect a multitude of features or embroidery abilities machine. You can expect though several sewing features that make the machine helpful when making clothes or repairing some old clothes. First thing first, the machine is very easy to use, even by a kid, we may add. It’s lightweight and has a compact shape that makes it easy to display and to carry around. The machine comes with 10 built-in stitches, which is ok for a new entry-level seamstress when making clothes. On the other hand, if you’re not that interested into exploring your creativity, it should be enough. You get to use the most common stitches and try something new like zigzag or stretch stitches. The 4-setp buttonholes increase the versatility of the machine and the free arm eases up your efforts when sewing some cuffs or sleeves. The machine presents many adjustments and you get to use one the three-presser feet (zipper foot, button foot or the buttonhole foot) accordingly. The stitch selector dial is easy to operate and so it is the bobby winding. The threading is not a nerve consuming operation either. The machine does come with built-in storage to help you keep nice and tidy the working area and the accessories in one place. The carrying handle increases the portability of the machine. The machine is easy to use and comes for a great price. Nevertheless, cons or not, we still the machine is a good option for any tight budget. Just because you’re new to sewing, doesn’t mean you can’t make a good investment right from the very beginning and get yourself a machine like the SINGER 4423 Heavy Duty Extra-High Sewing Speed Sewing Machine. The machine is able not only to get you through the first stages on sewing, but also to encourage your sewing creativity. This ability comes from the 23 built-in stitches that are also quite various. You may choose from 6 basic stitches in the beginning and step up your game after a while with 4 stretch stitches, 12 decorative stitches and one buttonhole. The list of features that ensure the ease of use includes the automatic needle threader, the top drop-in bobbin (with clear view cover), and the Snap-On presser feet. The machine is very fast and gives 1,100 stitches per minute. It comes with a strong motor that runs smooth and quiet. When it comes to build, we notice the heavy-duty interior metal frame that keeps machine in place at all times. The stainless steel bedplate gives smooth fabric feed and even sewing each time. The machine features four presser feet and you may use each of them for various jobs. Use the buttonhole foot when you add buttonholes, slots for ribbon, the zipper foot when sewing some cords or zippers and the button sewing foot for…buttons. For the general sewing projects, it’s better to use the all-purpose foot. The machine is easy to use and brings lot of power, considering its small size. It has a sturdy build and may surprise you with its performances on many jobs. Despite the minimal issues, when in need for a sewing machine that gets you through your ABC on sewing and more, don’t hesitate to try the machine. Many of us out there want not only to make clothes, but also to embellish them a lot. This brings them to choice of a sewing machine that is also an embroidery tool. Finding a good machine that delivers both good quality sewing and embroidering is not that difficult nowadays. Finding one with a price that doesn’t go over the roof- that’s totally another thing. This is how we get to the Brother SE400 Combination Computerized Sewing and 4×4 Embroidery Machine that exceeds your expectations on sewing and embroidery jobs at the same time. The machine comes with no less than 70 built-in embroidery designs, which gives you quite some many options to embellish your clothes. It also features 120 frame pattern combinations and almost 70 built-in sewing stitches (67 to be more accurate). The 5 embroidery-lettering fonts add up and increase the possibilities for you to decorate the clothes. You may find the machine highly dependable for sewing and embroidery, giving you a nice 4”x4” embroidery area. If you are into gadgets, the machine is definitely for you as you may also connect it to your computer. This way you can import or digitize embroidery designs directly from your computer. We didn’t go over the features and we need to highlight the automatic needle threading system that gives you speed on your jobs, the quick drop-in top bobbin and the bobbin winding system. The built-in push button and thread cutter make the machine easy to use and efficient. The risk for jamming is minimal and the machine runs rather quiet. Its English/Spanish manual is easy to follow and to apply. The backlit LCD touch screen display is easy to use and offers clear info’s. The multiple accessories that come along with the machine complete the description and may seal the deal for many of you. In the end, if you want to make clothes and embellish them also with some embroidery, the machine is definitely a great option. Once you got your favored sewing machine, get a table to work on and to house your machine.